We are open Tuesday to Sunday at the shack so plenty of opportunity to grab yourself some of our (Bristol Good Food) award winning vegetarian and vegan Indian street food. 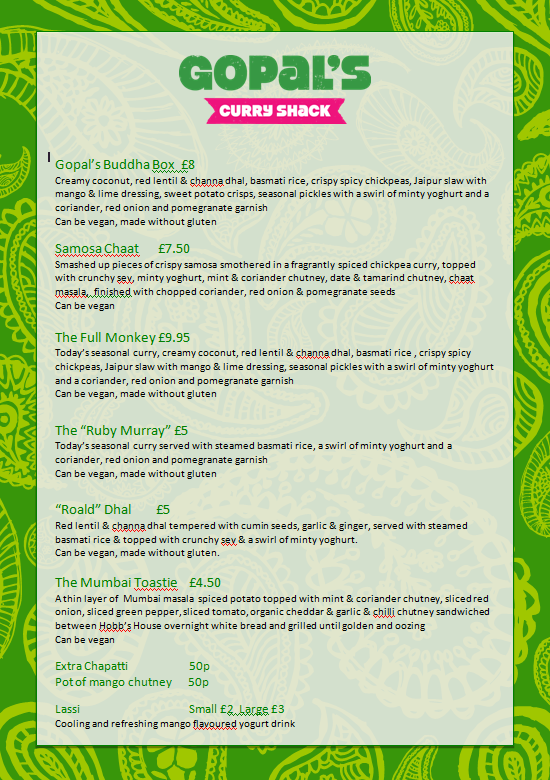 We make vibrant vegetarian and vegan Indian street food with a modern twist. We serve curries and Indian snacks, along with spiced chocolate brownies, cold drinks and depending on the event we can also offer hot drinks. Some of our best selling dishes are our sweet potato, red pepper & coconut curry and our spinach & onion pakoras. Our 12 seater micro-diner is available to hire for parties, birthdays, meet-ups or just about any excuse for a get together. Send us a message if you’re planning a special event. I had the good fortune to enjoy a meal at Gopal’s Curry Shack during their residence at The Old Bookshop. All the food is either vegan or can be made to be vegan. I had the thali which had a dahl, rice, some chick pea and spinach curry, flat bread and salad. It was delicious. I also had poppadoms and dips. The dips were really good and the garlic pickle had huge lumps of garlic in it which was bound to be a big hit with me. All for about 12 quid. Highly recommended, wherever they pop up.